Toyota Hilux Vigo and Toyota Fortuner's chassis frame called Toyota’s best (Toyota Outstanding Performance) Platform integrates an array of advanced performance features to offer stability and control for smooth and safe driving. best offer strength and good impact absorption and thus provides a more comfortable ride as well as less noise, vibration and harshness (NVH). 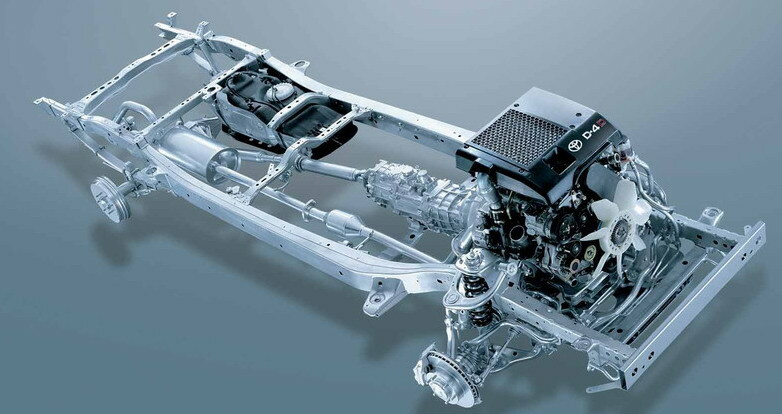 This advanced chassis frame sits on a coil spring suspension system comprising a double wishbone layout at the front and a 4-link layout at the rear. This gives it a suspension setting that is tuned to match road conditions in Asia and Africa, so there's good drivability, stability and comfort whatever the load on board. Click here for info on 2009 Toyota Hilux Vigo and click here for the main Vigo page. Pics of some of the vehicles we have recently exported are at http://www.sam4x4.com/pics.html. We are not only Thailand's best Vigo dealer and Thailand's best Vigo exporter of Toyota Hilux Vigo 4x4 but also Toyota Hilux parts and Toyota Hilux accessories. Please try Sam - Thailand's best Vigo pickup exporter. If you are looking for Toyota Hilux, Toyota Hilux D4D diesel, Toyota Hilux 4x4 Vigo or Toyota Hilux mini truck for sale it good to know that Toyota Hilux Vigo is always on sale at Sam Motors Thailand. If you are looking for best quality used Toyota Hilux Tiger and D4D Toyota Hilux Sport Cruiser, Sam is the place. The Hilux Vigo range is powered by either Toyota’s 16-valve 2.5-litre D-4D direct injection common rail turbo-diesel engine, delivering 102bhp & 300Nm/2,000 or the 16-valve 3.0-litre D-4D direct injection common rail turbo-diesel engine, delivering 163bhp & 343Nm/1,400-3,400. The 3.0 litre D-4D Common Rail Turbo Diesel 1KD-FTV- already among the most powerful and torquey in the sector - is carried over from the legendary Land Cruiser and offers enormous torque with excellent fuel consumption. The engine develops 120kW (163D|N hp) at 3,400rpm with torque of 343Nm across an engine speed range of 1,600 to 3,200rpm. Maximum speed is 106mph (170km/h) with manual transmission and acceleration from 0-62mph is under 12.7 seconds. D-4D actually stands for direct Injection 4 Cylinder Common Rail Diesel Engine. Common rail diesels inject a fine mist of fuel into the engine at very high pressure. The result is the same power and refinement as a petrol engine, but with better fuel efficiency and lower emissions. One feature of the electronic controls associated with the common rail is that there is no need to wait for glow plugs to warm up before starting the engine. You just turn the key and it fires up immediately. Toyota D-4D engines are not just noteworthy for their smooth, linear torque, though: that's a characteristic of most modern diesel engines. What D-4Ds are noteworthy for is their unusually high power outputs, equivalent to that of many competitors' similarly-sized petrol engines. The D-4D's rev range is also usefully wider than normal, further enhancing the driving experience. This modern technology makes use of a high-pressure pump, a common rail, and computer-controlled injectors to deliver exactly the right amount of fuel to each cylinder, at precisely the right timing. It is this exact timing and fuel measurement that leads to better combustion, cleaner burning and lower emissions of harmful substances such as soot (meeting European Step III exhaust gas regulations). And it is common rail injection that ensures D-4D engines deliver the optimum in power and torque throughout the range of rpm, for better driving performance and comfort. Fuel in the D-4D is pressurised to an extremely high 135mpa within the "common rail" that feeds all four cylinders (older diesel engines have a separate pipe leading from the pump to each cylinder). The high pressure injection creates better fuel atomisation for complete burning and increased power output. And because there is less fuel wasted though inefficient combustion, the D-4D delivers better fuel economy too. In addition the computer control unit injects a small amount of fuel into the cylinder just before the main fuel load ignites. This "pilot burn" lowers the explosive force of the main combustion process and goes a long way to reduce the noise and vibration formerly associated with diesel engines. This all goes to make it one of the silkiest diesels ever built. All 3000 cc (actually 2982) Vigos come with this excellent engine. F in FT stands for "economical" twin cam (narrow angle, around 22 degrees) and T for turbocharged. First appeared in the 2000, the 1KD-FTV is one of the newest engines build by Toyota. 1KD-FTV a 3.0L (2982cc) straight-4 common rail variable nozzle turbo (variable geometry turbocharger) coupled with a 32-bit ECU and Multi Pilot Injection System, diesel engine Turbo diesel engine with an Intercooler. It has 16 valves and a DOHC (double overhead camshaft). Bore is 96 mm and stroke is 103 mm. 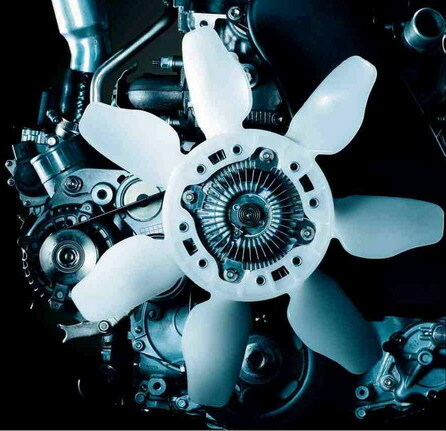 It powers 170 hp (125 kW) at 3400 rpm, and 35.9 kgf･m (352 N·m) of torque at 1800-3400 rpm. Redline of this engine is at 4200 RPM. Compression ratio is 17.9:1. 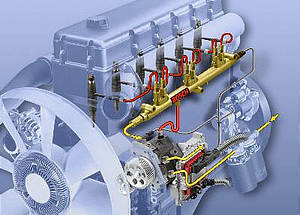 This engine uses D-4D (Direct Injection 4 Stroke Common Rail Diesel Engine) electronic Common Rail (Common rail direct fuel injection ) technology, produces ultra high pressure, 135 mpa (1350 bar), which is about 8 times more than the pressure of the normal fuel injection system within the "common rail" that feeds all four cylinders (older diesel engines have a separate pipe leading from the pump to each cylinder). This combined with the 32-bit ECU which controls fuel quantity, valve-timing, and accurate pressure at different engine revolutions result in the most fuel economy and also in the full utilization of power, whether it is during taking off or during taking over, without having to drag the engine revolution to the maximum. Making the achievement with the fuel consumption 11% more effective compared to its predecessor 1KZ-TE engine thus 17% more powerful. Fuel consumption is also 12% more effective than the all new Toyota Hybrid engines. The Pilot Injection System helps smooth engine running like sitting in saloon cars. The noise level is only 49 decibels at the idle speed. The Pilot Injection System produces fuel injection in advance before the main injection starts working, reducing Ignition Lag Time and resulting in continuous and complete combustion. Noise from ignition is also reduced. The 3.0-litre D-4D is the latest derivative of the renowned diesel engine which also appears in the flagship Toyota Land Cruiser range. It features second-generation common-rail technology, smooth control of the turbocharger variable vanes and a swirl control system for maximum efficiency. The common rail system develops a maximum pressure of 1,600 bar, allowing the use of injector nozzles with smaller diameter holes to create a more homogenous air-fuel mix, improving the efficiency of the combustion process. This translates into more performance with lower emissions and lower fuel consumption. The improvements introduced to the combustion process mean the compression ratio can be lower, at 17.9:1, than in other, less advanced diesel engines. This results in less heat build-up in the piston bowl and a more efficient combustion process, therefore enabling more performance with lower emissions and less noise. One key to the impressive power and torque output of the 3.0-litre D-4D has always been the sophisticated, variable vane, turbocharger. Toyota uses an electric DC (direct current) motor to activate the variable nozzle vane mechanism, instead of the conventional step motor. The result is sharper response from the turbocharger, particularly at lower speeds. The engine also benefits from a Swirl Control System. Each cylinder is supplied with air/exhaust mixture through two different ducts. Butterfly valves operated by the Swirl Control System can shut off one of these ducts according to the engine speed and load, increasing the mixture's swirl rate. At low engine speeds this device improves the air-fuel mixture, thus increasing torque availability at low speeds along with lower emissions. The direct injection engine under the code name " 2KD-FTV " with 2494 cc capacity, generates a peak power of 75 kw at 3,600 rpm, a maximum torque of 260 Newton-meter at 1,600-2,400 rpm. for the 4-wheel drive version. For the 2-wheel drive version, the peak power is 75 kw at 3,800 rpm, a maximum torque of 1,400-3,200 Newton-meter at 1,400-3,200 rpm. 2KD-FTV The Most Economical One: The common rail fuel injection produces ultra high pressure which is 8 times more than the pressure of the normal fuel injection system. It can inject much finer fuel mist. This, when combined with 32 bit ECU which controls fuel quantity, valve-timing, and accurate pressure at different engine revolutions, result in the most fuel economy. It is 21% more economical than the old version. It has greater fuel economy than most of its competitors. 2KD-FTV The Most Powerful One: With the 16-valve, double overhead camshaft (DOHC) engine technology, which was formerly available in saloon or sports cars only, and with power from the turbo-charger coupled with the ingenious design, the D4D engine produces maximum torque at a much wider range of speed. This results in maximum utilization of power, whether it is during take off or while taking over, without having to drag the engine revolution to the maximum. The Pilot Injection System smoothes the running of engine and the ride feels more like a ride in a saloon car. The noise level is only 49 decibels at the idle speed. The Pilot Injection System produces fuel injection in advance before the main injection starts working, reducing Ignition Lag Time and resulting in continuous and complete combustion. Noise from ignition is also reduced. First released in August 2004, the 2KD-FTV is the 2nd generation of the KD engine with a smaller 2.5 L (2494 cc) straight-4 common rail variable nozzle turbo coupled with a 32-bit ECU and Multi Pilot Injection System, diesel engine. The displacement of this engine is based on the 2 L engine. Bore remains the same 92 mm but stroke is increased to 93.8 mm. Like 1KD-FTV, it has 16 valves and is a DOHC engine, comes with an intercooler as well (applies on some region). It powers 102 hp (75 kW) at 3400 rpm and 191.7 ft·lbf (260 N·m) of torque at 1600-3600 rpm without an intercooler, 120 hp (88 kW) at 3400 rpm and 239.85 ft·lbf (325 N·m) of torque at 1600-3600 rpm with an intercooler. Compression ratio is 18.5:1. Redline of this engine is 4400 RPM. This engine also uses D-4D Common Rail (Common rail direct fuel injection ) technology. The only technical data changes from the 1KD-FTV to the 2KD-FTV was the bore and the stroke. All internal combustion engines need two key ingredients to operate: air and fuel. The precise delivery of these ingredients is what makes clean and powerful combustion possible. If you can get a large amount of air pumped in you increase the power of the engine and if you get large amount of fuel pumped in as well the power is enhanced even further. Turbochargers accomplish the first goal by helping deliver copious amounts of air to help diesels operate cleanly, efficiently and powerfully, commonrail accomplishes the second. High fuel pressure produces a fine mist of fuel that burns better and cleaner in the combustion chamber. Not only that, but for each combustion cycle, the common rail allows up to five injections per cycle. The driver benefits as lower fuel consumption (improved mileage), better engine performance and less noise compared with older diesels. The way in which fuel is injected into the cylinders of diesel vehicles determines their torque, fuel consumption, emissions and noise level. Two factors are key: the fuel pressure as it enters the cylinder, and the shape and number of the injections. A common rail injection system separates these two functions (generating pressure and injecting) by first storing fuel under high pressure in a central accumulator rail and then delivering it to the individual electronically-controlled injection valves (injectors). This ensures that incredibly high injection pressures (in some cases over 25,000 pounds per square inch) are available at all times. The electronic injection system has multi-pilot injection control to determine the volume, timing and count interval between pilot injections and main injection. Click here to learn about other new diesel technologies.